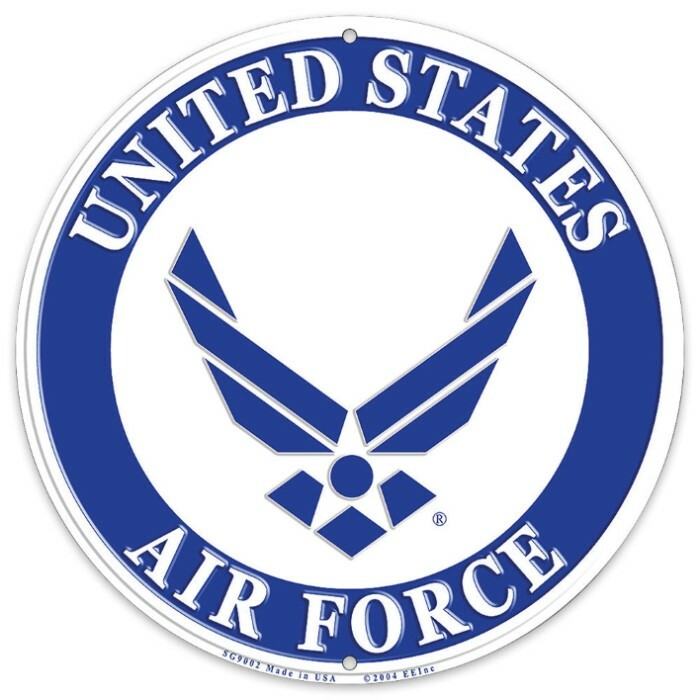 US Air Force Logo 12" Round Aluminum Sign | BUDK.com - Knives & Swords At The Lowest Prices! The United States Air Force has a proud tradition of defending our great nation since those early World War I dogfights in the skies above Europe when the branch was known as the Army Air Corps. The history of the branch's famous seal is nearly as storied. This US Air Force Logo Sign is a simple yet effective way to show your pride as a vet or active duty Airman; it also makes a great gift for the Air Force vets in your life. The iconic Air Force wing motif is displayed brilliantly in blue on a clean white background, "United States Air Force" spelled out along the circumference. Cast with tough aluminum and colored with top quality inks, this sign can take even the harshest outdoor conditions for years without rusting or fading. At 12" in diameter it's the perfect size for practically any location - living room or bedroom wall, display or curio case, military collection, garage walls - the list goes on! The patriotic sign is easy to hang or mount with the handy nail/screw holes at the top and bottom. Show your love for the brave men and women who defend our freedom and order today!